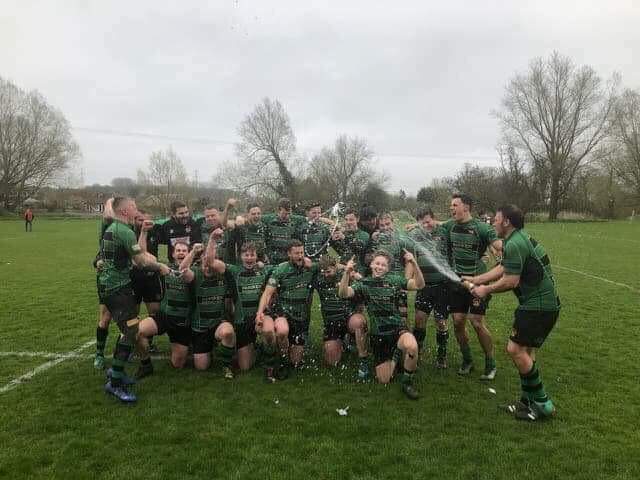 Beccles secured the league title and promotion with a hard fought victory at second placed Hadleigh. Beccles battled hard to win by 7 – 24. Beccles were able to travel with a strong squad and new that avoiding defeat would secure top spot in the league with a game to spare. In the early stages both defences were on top with neither side able to break through. It was twenty minutes before Beccles were able to open the scoring. They eventually found some space around the outside of the Hadleigh defence. A good run and pass by Holtzer found Barrett who finished well. Kauri added the conversion. Beccles added the next try to open up a gap. A Beccles break was stopped inside the Hadleigh twenty-two. Kauri spotted there was nobody covering the short side and strolled over untouched for the try. He added a difficult conversion from the touchline. Hadleigh battled back in to the game and put Beccles on the back foot. Beccles conceded a number of penalties as the half time mark was reached and Hadleigh went over for a converted try in first half stoppage time. Beccles stretched their lead with a penalty early in the second half. Beccles upped their line speed in defence and Hadleigh couldn’t find their way through the green wall and were regularly driven back. As the game moved in to the last ten minutes Beccles secured the win with another try. Hannam found a gap in the Hadleigh line and went through. He fed Kauri in support who went over for his second try. He added the conversion. There were still five minutes to see out which Beccles did before the celebrations started. Beccles have one more league game left when they travel to Colchester on Saturday. They then take on Southwold in the Pony Moore Cup on the 27th of April.